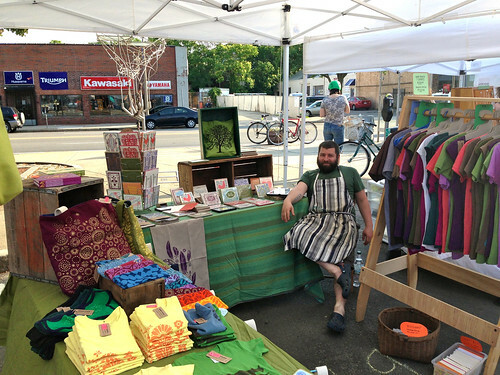 We are on a reduced craft-fair schedule this summer, because we’re doing massive renovations on our house and need to focus on the home front for now… but we are doing just a few that are especially nice and close to home. Union Made is the summer version of Bazaar Bizarre Boston, which was a great craft fair that we did for the first time in December 2012. It’s not so far from home and we had such a nice time there in December that we were excited to check out the summer fair. It was indeed really nice, 94 degree weather notwithstanding. We actually stayed out late the night before to see the current incarnation of Os Mutantes play in Portland, so we were pretty tired (generally I would NEVER do a crazy thing like that on the night before a craft fair! But I really love Os Mutantes. And they were really super fun, so I’m not sorry), and on top of that it was humid and muggy. Kind of felt like being in an armpit all day, but it could’ve been worse, weather-wise, and we had a pretty good time anyhow. We met lots of nice shoppers, sold lots and lots of cards and bags and goodies, and really enjoyed meeting our neighbors, who were all pretty fun. One of the things I really liked about Bazaar Bizarre is how well-organized and friendly and supportive it feels, and Union Made was just the same. Thanks to shoppers, neighbors and fair organizers for the great show, looking forward to next year already!